Al Purdy (1918-2000) was one of Canada’s greatest poets whose works focused on Canadian identity, including poems about hockey. He was a prolific poet at an early age and published his first poem in his high school yearbook. During the Great Depression, at the age of 17, Purdy left school and rode the rails out west. When he returned to Trenton in 1939, he joined the Royal Canadian Air Force and fought in the Second World War. He returned to writing after the war and published his first collection of poetry in 1944. 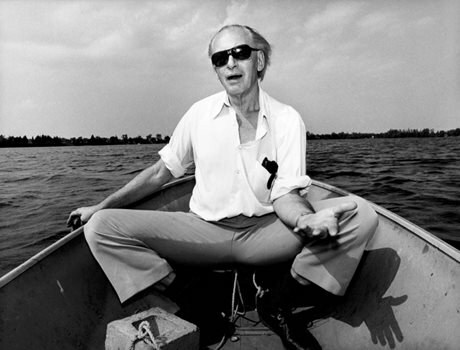 In 1957, he and his wife Eurithe built an A-frame cottage in Ameliasburgh, Ontario, where Purdy did most of his writing and developed his unique style. In 1965, Purdy wrote Hockey Players, a poem that captures the game – which Purdy described as a combination of ballet and murder – as a dangerous sport. Read Purdy’s poem Hockey Players on the How Pedestrian website. Visit The A.W. Purdy Digital Archive from the University of Saskatchewan website.